Texts & Pleasure: The Wonder of Time's Passing in Mordecai Richler's "Barney's Version"
The Wonder of Time's Passing in Mordecai Richler's "Barney's Version"
We languished in bed a good deal of the time, not making love but in search of warmth, dozing, reading (me into Jacques Préverts Paroles, which she scorned), comparing difficult childhoods and congratulating each other on our amazing survivals. In the privacy of our refuge, far from the café tables where she felt compelled to shock or, anticipating criticism, to pick at the scabs of other people’s weaknesses, she was a wonderful storyteller, my very own Scheherazade. Barney’s Version recounts the life of man who spent his younger years living the Moveable Feast lifestyle in the Paris of the 1950s. Later, he would move to Montreal and rake in millions of dollars by founding Totally Unnecessary Productions and producing self-proclaimed garbage television for the CBC. Barney spent his Hemingway years as a sugar daddy of sorts for more artistically talented people, being the only one among his clique with a “real” moneymaking job in exporting. Throughout his story, he marries three different women (twice divorced) and is narrowly acquitted for the murder of one of his best friends. 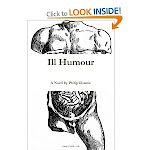 Add to these plot points Mordecai Richler’s sensational humour, his understanding of desire and mortality, and his precision in rendering characters, and you have a masterpiece of Canadian Literature. My experience of Richler before Barney’s Version was limited to The Apprenticeship of Duddy Kravitz, which is a very good book. But Barney’s Version blows Kravitz out of the water with its scope, ambition, and understanding of human behaviour. In the vein of a Henry Fielding, Richler is a clockmaker, a man who can craft a novel with thousands of intricate moving pieces, and position each one of those pieces in perfect harmony for both comedic and dramatic effect. For those readers who don’t know the mystery behind Barney’s close friend, Bernard “Boogie” Muscovitz, I leave you to gape in awe at this book’s incredible final pages. I’ll try to list just a few of the things that make these sentences so great. First, Izzy’s voice is brilliantly boorish in its paternal affection and sexual insinuation (forcefully putting his son’s hand on his hip to “feel his gun,” as it were). Second, Barney’s mention of his unspecified ruin direct the reader’s intrigue toward future plot development. My favorite part of this passage, however, is Izzy’s violent promise to use his revolver to “fucken air-condition” anyone who messes with his son. Now I don’t know what “air-condition” means as a verb in this context, but what makes it so funny is precisely that I don’t know what the hell Izzy is talking about. This was a definite laugh-out-loud moment for me. I was at my brother’s wedding this past weekend, and at one point, one of his med school buddies whipped out a few Montechristo cigars (Barney’s favorite) and I couldn’t help but compare the moment to the wedding scenes found in Barney’s Version. In fact, I can safely say that no book has ever woven itself into the fabric of my everyday consciousness as tightly as Richler’s. Barney’s mistakes (I won’t tell you which ones) have become cautionary tales that I frequently apply to my life on a very practical level. To be perfectly honest, I’ve begun to reevaluate my life since reading this book, asking new questions about who I am, what I’m doing, and where I’m going. Thinking about Barney’s Version and my brother’s wedding has made me meditate on the nature of time, on how quickly one of the most beautiful nights I’ve ever had the privilege to participate in was finished in the blink of an eye, relegated to the realm of memory (when I groggily awoke the next morning, the majority of guests had already left the hotel and flown out of Toronto’s Pearson Airport). 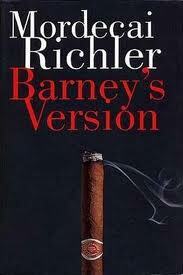 Richler is best known as a humorist, and when it comes to Barney’s Version, you can’t argue with the laughs. But there is something deeper going on in this book. Something I wish I had the power to articulate. Time passes; people die; we return home for thanksgiving dinner one relative fewer, and the wooden leaves that once extended our dining tables remain inside their cupboards. Weddings end, people return to their lives, and this leaves only the pang of memory. To find a distilled version of this sensation, I would direct any reader to the middle, “Time Passes” section of Virginia Woolf’s To The Lighthouse, which sent me into a complete emotional meltdown when I first read it. I am not talking about nostalgia here, but the sublime stupor one can feel at the sheer fact of time passing. It’s not the idea that the past was somehow better; only the fact that it’s irrevocably gone. We grow older. I don’t really know what else to say. Give this book a read if you get the chance. In the most clichéd of terms, Barney's Version made me laugh and made me cry. It's not until a book actually does this to you that you realize what a rare and beautiful thing it is.